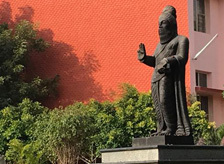 The Thiruvalluvar University was established at Vellore by Government of Tamilnadu in October 2002 under the Thiruvalluvar University Act, 2002 (Government of Tamilnadu Act 32 / 2002). The Post Graduate Extension Centre of the University of Madras, which was functioning in Vellore before 2002 formed the core of Thiruvalluvar University. The University was inaugurated on 16.10.2002 as a State University by our Honorable Chief Minister SELVI DR. J. JAYALALITHAA. 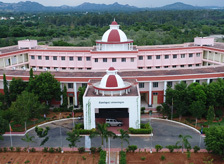 The University is located in a Sprawling Campus of about 112.68 acres at the Serkkadu near Vallimalai about sixteen km away from the Vellore City on the Ranipet-Chittoor Trunk Road. 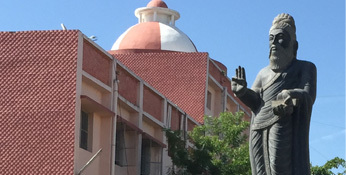 The University named after the great Tamil Saint “Thiruvalluvar”is enshrined with the motto “கண்ணுடைய ரென்பவர் கற்றோர்”. 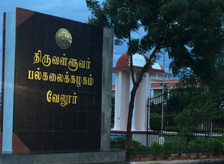 The Thiruvalluvar University has been seven departments, Tamil, English, Economics, Zoology, Chemistry, Mathematics and Bio-Technology. 123 arts and Science college are affiliated to this university, of which 13 are government Arts and science colleges, 9 are aided Arts and science colleges, 2 oriented colleges, 93 are self financing Arts and Science Colleges and the remaining 6 are University Constituent colleges. A Post Graduation Extension Centre of this /university is functioning at Villupuram. School of Distance Education (SDE) of Thiruvalluvar University has come into existence from the academic year 2011-12.